Foreclosure houses can sit vacant for long periods of time, look distressed, and require extensive work to be inhabitable. When a property owner fails to make the payments, the property is subject to a foreclosure auction. If no one makes the minimum bid at a foreclosure auction, ownership of the property stays with the lender. Foreclosure property is purchased at the auction or from the lender after the auction. Foreclosed houses and property might sell for less than market value. Homeowners and Investors often seek foreclosure property in an effort to save money. To get a good deal, the purchaser carefully inspects the property because most foreclosure property is sold “as is.” Usually it takes Investors five (5) steps from finding and closing on a foreclosure property. The bank or lender files a notice of default with the county recorder’s office when the property owner fails to make the mortgage payments. If the owner does not make up the payments, the property usually sells at an auction on the steps of the county courthouse. Notices of the auction are posted at the courthouse and in the legal section of newspapers. 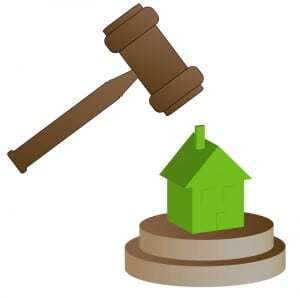 For the property to sell at the auction, the purchaser must make the minimum bid. Usually, payment is required immediately after the auction. If the minimum bid is not reached, the lender owns the property or “takes it back”. To find out what properties will be auctioned or otherwise are available to buy, contact real estate brokers who specialize in foreclosure property. Lenders usually contract with real estate brokers to sell foreclosed houses or other property. Lists of available foreclosure properties are found on websites for banks, the U.S. Department of Housing and Urban Development, and other government housing agencies. Also you can obtain a list of upcoming auctions usually from your county or city tax department. It usually isn’t possible to carefully inspect a property prior to a foreclosure auction. But once the lender owns the property, inspections are allowed. Visually inspect the property and arrange for a professional home inspection. Request that the utilities be turned on to check for any electrical or plumbing problems. Contact a title company and arrange for a title search to uncover any liens on the property or other problems. Assess the value of the property and estimate the cost of needed repairs and upgrades. If cash isn’t available to purchase the property, contact a bank or other lender to arrange for a loan prior to making an offer. The type of loan often depends on whether the purchase is for a primary residence or an investment property. Determine whether a loan is necessary to purchase the property as well as fix it up. With the assistance of a real estate broker, place a competitive offer. Be prepared to pay earnest money when making the offer. Earnest money is a deposit that indicates the buyer is making a serious offer. Follow escrow instructions once the property owner accepts the offer. Jeff Adams is the nation’s leading expert in finding motivated sellers, hungry buyers, and private lenders through the Internet. His automated online investing system for attracting buyers, sellers, and investors has allowed him to do over 350 deals since 1995 while having a regular job the whole time as a firefighter! After working at real estate investing the hard way, Jeff finally swore to himself that he’d had enough: He then invested serious time and money into creating systems that would pay off in less aggravation, more time, and more profits! Jeff developed systems that meant… He could stop knocking on doors of people in pre-foreclosure. Instead, the real motivated pre-foreclosure prospects now call him; He didn’t have to compete head-to-head with other investors that had the same pre-foreclosure lists; Jeff’s systems now set him apart from the competition; Jeff was no longer tied to the office, because his “Virtual Office” systems work from any web connection; He saved hundreds of thousands of dollars each year in real estate agent commissions, because his systems now do that work for him; and Jeff also saves hundreds of thousands each year in hard money lender points and fees. Jeff Adams now has all the money he needs, lined up and ready to go.